If your resume content and design has landed you a job interview, you are definitely on the right path! Writing impressive targeted accomplishments within the content of your resume using a modern resume design has paid off! Your next big hurdle is the job interview phase. If you design your resume properly, you will not only receive a request for an interview with a hiring company, you will excel during your job interview. How do I develop my resume content to help me during other phases of the job application process? 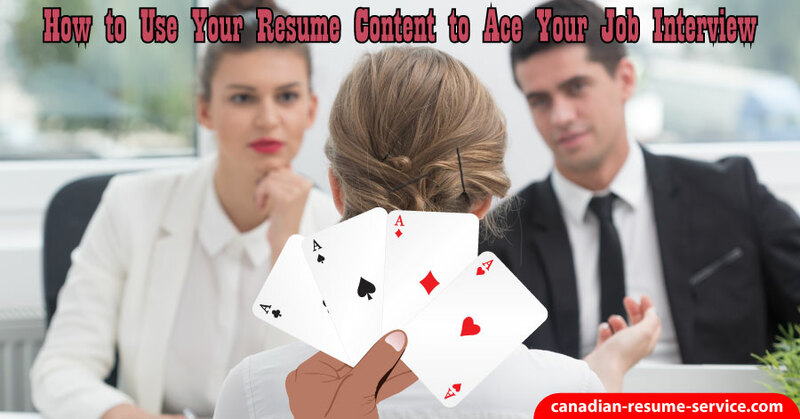 Resume content should contain professional achievements, hard skill sets, and areas of expertise that make you a top qualified job candidate to set you apart from your competition. 1. Increased sales by 20%. 2. Decreased company spending by 35%. 3. Boosted client recruitment by 23%. Those points are impressive, but let’s make them sound even better! We have the facts, but we need to include HOW and WHEN. 1. Increased sales by 20% over the first quarter by actively pursuing new accounts and forging positive relationships with key clients. 2. Decreased company spending by 35% by sourcing new sub-contractors and suppliers, while still ensuring high-quality products and service. 3. Boosted client recruitment rates by 23% from 2015 to 2016 by analyzing demographics and launching a new marketing campaign that was targeted toward the correct population. • First, select professional accomplishments relevant to the position you are applying for. The positions do not have to be exactly the same but require some of the same skill sets and abilities. • It’s crucial your achievements be put into context; hence the “improved” list I have provided you with above. The reader is able to understand what you did, how you did it, and over what time span it occurred. • Use as many facts or figures as possible. When you provide a hiring manager with figures or percentages, you are providing him/her with concrete and tangible numbers, instead of a vague description. • Employ the C.A.R. acronym. C.A.R. stands for Challenge, Action, and Result. o What was the Challenge, problem, or task you were faced with? o What Action did you take to remedy it? o What was the Result? So how can this resume content help me during my job interview? If you have your job accomplishments memorized, you will be set to answer questions that might be thrown your way – this is particularly true for a Behavioral Descriptive Interview (BDI). In this type of interview, the interviewer will say, “Tell me about a time when you had to do X.” X could represent a number of things: collaborated in a team, solved an almost impossible problem, dealt with a moral issue, demonstrated creativity or thinking skills, and so forth. Use the C.A.R. method, as well as your examples, to answer these questions with ease. Try to work a relevant core competency into your example, which is once again concretely demonstrating your abilities to perform the position available. A core competency would be any hard skill needed to do the available job. Next, let’s talk about hard skills sets and areas of expertise to include in your resume content! Non-tangible skills, aka soft skill sets, can be incorporated into the profile of your resume and throughout your cover letter. Hard skill sets should be highlighted in your resume profile, within your professional achievements, and in a separate section entitled, “Areas of Expertise” or “Core Competencies”. In this section, you will want to choose about 8-12 areas of expertise or skills that make you an excellent job candidate. They may be represented in list format or as a table. Areas of expertise should be on the first page of your resume, after your introductory paragraph or professional profile, so readers are able to hone in on them right away. This section should incorporate hard skills that are relevant to the job you are applying for but may include additional traits, which are desirable to a company and demonstrate your versatility. For instance, if we use the sales and marketing example above, you will want to include the hard skills I’ve mentioned already (Brand Design, Budget Development, Global Economy Penetration, Print and Social Media). Only use skills that truly apply to you of course – and incorporate other competencies you want to showcase. These abilities could include an Interdepartmental Relations, Staff Recruiting, Streamlining Operations, and so forth. How can hard skills and core competencies help me during my job interview? Using storytelling throughout the interview is an excellent method to build credibility and share your accomplishments to showcase your tangible skills and abilities. During a job interview, you will be required to list and/or demonstrate your greatest strengths and skills that make you the best candidate for the job. If you are not asked outright for these talents, i.e. such as during a BDI, make sure you slip them in as much as possible. Sell yourself by sharing what you have done for past employers. Need help writing your resume content to generate interviews? How about some interview preparation to help you really shine? Check out our resume writing services or reach out to Candace via email or call toll-free 1 877 738-8052.